It isn’t a secret that the ooze (you had to go their Rich) changed 4 pet turtles and their rat master into “lean, green fighting machines.” Their exact origins vary depending if you’re going by the original comic, cartoon, or 1990 movie that didn’t have a popular ninja rap. Not surprising as a child of the ‘80s I think of the cartoon first. Then their first words, “pizza.” Ahh. Ghostbusters, The Real Ghostbusters, and Teenage Mutant Ninja Turtles will be forever linked by the period they were around, how both shaped impressionable minds, which franchise’s toy lines would ultimately spend more of our parents hard earned money, the debate that TMNT was a factor in RGBs ending, and now a current toy line that sorta emulates our beloved ghostbusting heros. Playmates who have the rights to TMNT toys have been making them since I was about 9 years old. Is this important to this entry? Sometimes their turtle variants were strange and out there. Same could be said of Kenner’s RGB figure lines. What we didn’t know then was that more figures made respective toy companies a lot of money. Hit cartoon series and marketing with the best toy commercials made us want a lot of the “out there” figures. 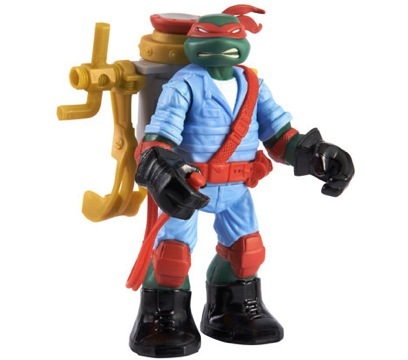 I doubt Playmates would have dared to make “heroes on a half shell” figures that looked like they were ready to team up with The Real Ghostbusters. TMNT has been enjoying a renascence (smooth) in the twenty teens. With a serious lack of Ghostbusters figures at this time Playmates released their Mutagen Ooze figure line. Why didn’t they just call it Mutagen Ooze blower? Two out of the four figures wear flight suit type outfits and all 4 mutant turtles have “back packs” that can be filled with ooze. Need more proof someone at Playmates was thinking of Ghostbusters? A prototype Leonardo even included a name tag. Previous Post Where’s The Ectocontainment?